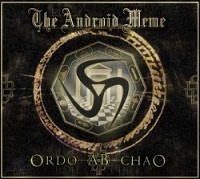 Review: "Android Meme, The: Ordo Ab Chao" - Sea of Tranquility - The Web Destination for Progressive Music! My interest was piqued by this release mainly by the fact that it appears on a record label, Magna Carta, that I had assumed had ceased to exist long ago. If my memory serves, most of the outfits on the label were from the more traditional end of the prog rock/ metal spectrum, but Canadians The Android Meme are far from this definition, boasting a more modern sound on this, their debut release. Vocalist Stefano Dementia (possibly not his real name!) has diction and tone that is similar to Maynard James Keenan; that, and the sometimes complex, technical, almost mechanical nature of the music brings Tool to mind at times, although there's definitely more to the band than that. In fact, the longer, more Tool-like tracks ('Polar Rose', 'Left Right Parasite') are amongst the weaker on the album, seeming to sacrifice strong song-writing for complexity and instrumental technique. Instead it's generally the shorter, more direct tracks that make an impact � opener 'The Machine Stops' sets the right tone, a grandiose yet punchy rocker with meaty riffs; the bouncy 'Sumii' successfully integrates electronica into a rock framework; 'Sigma' is a stately number with a choir on the chorus, whilst the title track has a tense and nervy feel. Possibly saving the best to last, the dark and ominous 'Stranger' finishes the album on a high. Personally, I found the production a little dry and thin; a fuller sound may have brought more out of the songs. Overall though this is an intriguing debut from a band I hope to hear more of in the future.